The MFC-8950DWT is a monochrome laser all-in-one with wireless and wired networking. 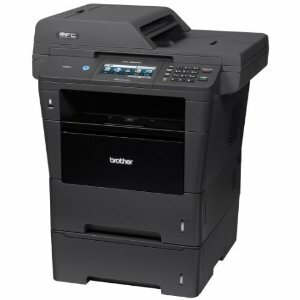 Ideal for businesses with higher print volumes, it combines printing and copying up to 42ppm, color scanning and faxing. Plus, it offers a 5-Inch color Touchscreen display, automatic duplex print/copy/scan/fax, a 1,050-sheet paper capacity, and a super high-yield replacement toner cartridge for low cost output.